It’s been a dream of mine for quite a while now to eat a lobster roll on the idyllic shores of Maine. 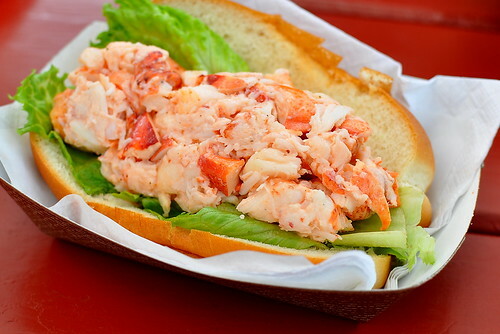 Lobster rolls are a treat just about anywhere, even in downtown Los Angeles, but having one made by cooks who’ve been doing it for decades using freshly caught lobsters seemed like it would be even more perfect. A gentle New England breeze wouldn’t hurt either. I always knew this scenario would play out at some point in time, most likely on an epic cross-country road trip, but it happened sooner than expected when The Astronomer’s parents planned a day trip to Harraseeket Lunch and Lobster on our Memorial Day trip back east. Mama and Papa Chaplin used to visit this seafood shack during their days living in Boston and were excited to introduce the brood to their special spot. I could not have been more thrilled. 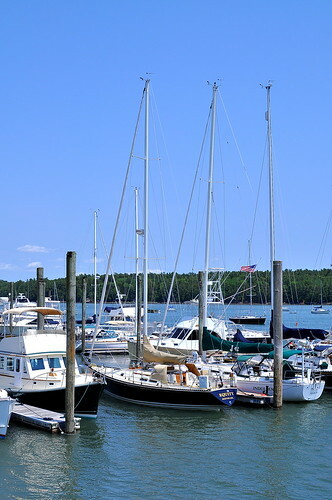 After a two hour long drive from Boston, we arrived on the shores of South Freeport, Maine—also known as “So. Free. Me.” to the local set. The weatherman had predicted gray skies and a light drizzle on the day of our visit, but fortunately we were greeted with warm, sunny rays when we arrived. 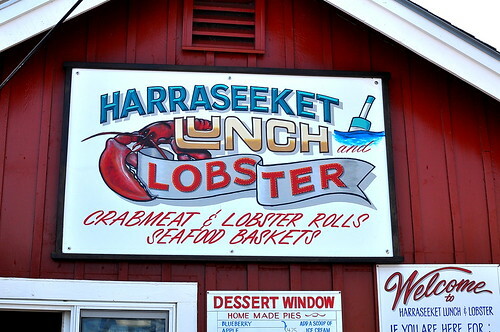 Harraseeket Lunch & Lobster, which is open for lunch and dinner from May to October, has been owned and operated by the Coffin family since 1970. With fishing boats docked along the shore and pine trees lining the bay, the scene was even more picturesque than I had imagined. Our orders were ready for pick up soon after we placed them. Time to dig in! 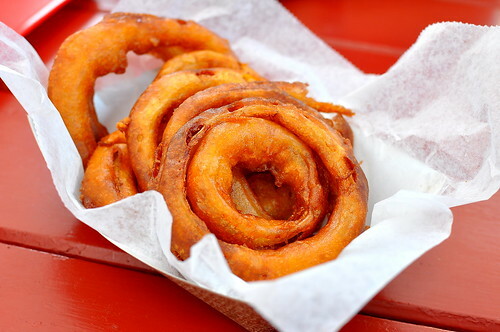 In addition to our main dishes, onion rings ($4.25) were shared with the entire table. Dipped in a little ketchup, the rings were so very satisfying, despite being greasy. Everyone loved how the batter clung onto the onion, making sure that no one endured a mouthful of one without the other. 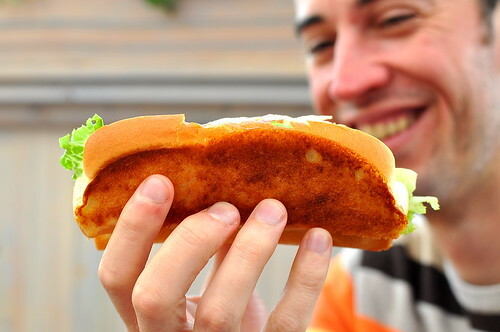 My roll ($14) was brimming with mayonnaise-dressed lobster and a collar of lettuce, tucked inside a toasted split-top bun. My first bite included some of everything, but subsequent ones were lettuce-less. 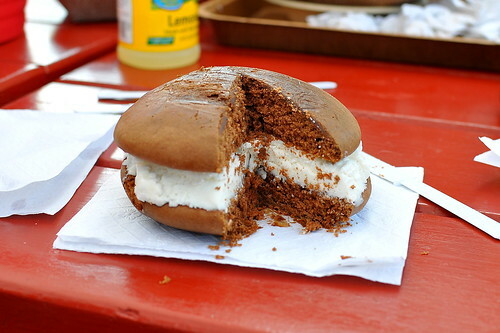 I didn’t want anything to detract from the sweet meat and buttery bun. Take a look at that golden sear! My first-ever Maine lobster roll totally met my expectations. 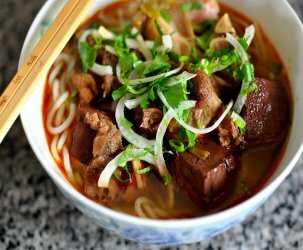 It wasn’t head and shoulders better than rolls I’ve had in the past, but eating it steps away from the coast made the experience all the more special. 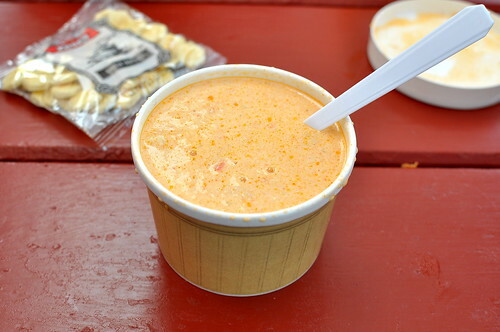 To supplement my roll, I also enjoyed a cup of lobster bisque ($4.95). The best part was the big hunks of lobster meat swimming in the buttery rich broth. This was really good stuff. 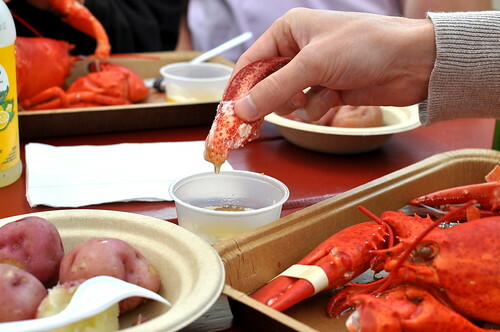 The Astronomer dug into a freshly cooked lobster ($13.99 per pound), which was served with boiled potatoes, melted butter, and a claw cracker. 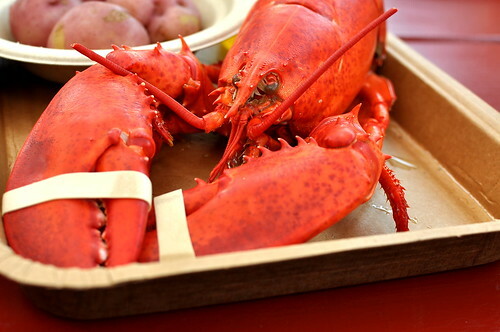 Taking a cue from his lobster-loving parents, he started with the claws and worked his way down. After a bit of effort, he was rewarded with a beautiful morsel of claw meat. 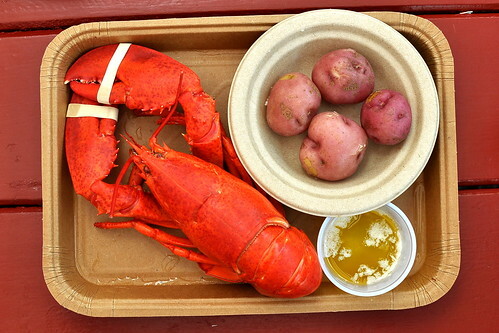 Dipped in warm butter, the lobster tasted like a decadent dream. Even though I didn’t labor at all, The Astronomer shared many generous bites with me—whatta guy! 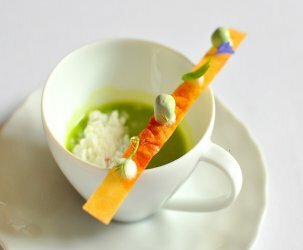 All of the desserts served at Harraseeket are made using family recipes that have been handed down through the years. 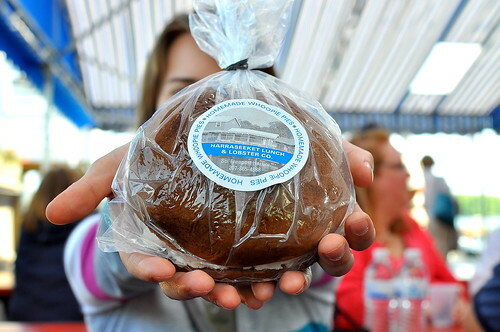 To finish, our entire party shared a humongous whoopie pie ($3.75). The monstrosity weighed close to a pound. After dividing the pie seven ways, we each took a bite of our wedges. The chocolate cake was a touch dry, but when it was paired with the thick layer of frosting, I hardly even noticed. The pie was finished on the car ride home; it seemed that a couple of hours in the sun aged it quite well. 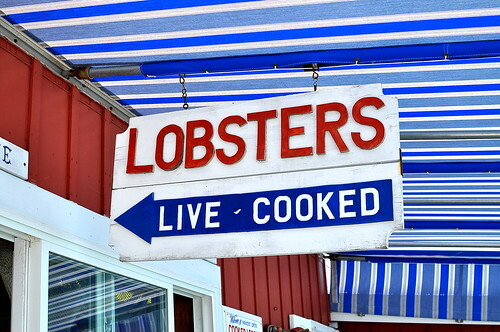 New England’s tradition of summertime seafood shacks is a splendid thing. I hope we’ll do it again sometime soon. A $14 lobster roll. Awesome. 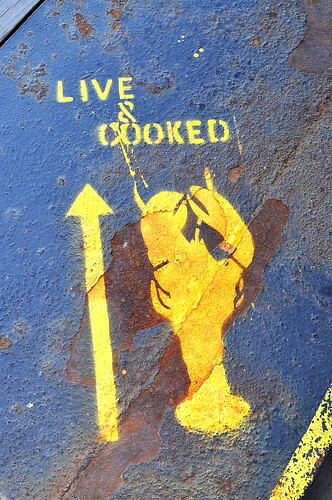 Years ago I ate a twin lobster dinner on a boat in Maine. I think it was $30. 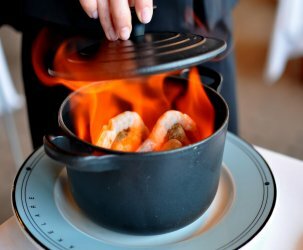 Similar to you, it wasn’t the best lobster I ever had, but the whole experience was unique enough make it my favorite lobster dinner. 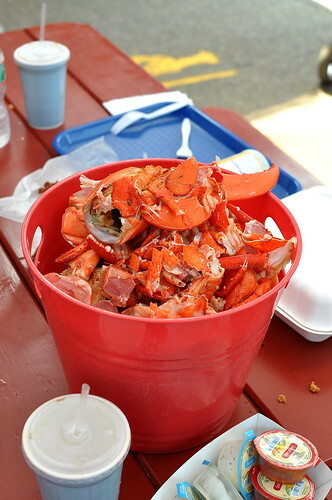 Lobster will be one of enjoyed perks when I move to the east coast…. 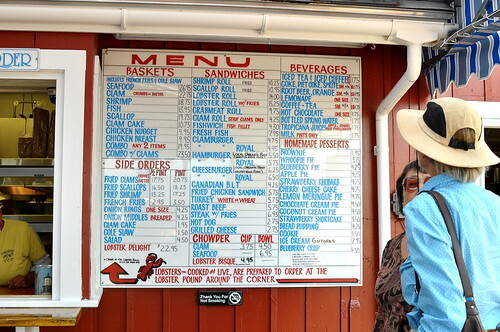 Awesome: My squeeze and I are keeping a list of lobster rolls we need to eat after I finish (hopefully!) the Maine Maraton in September. This totally just shot to the top of that list! Now that’s a great motivator to run FAST, Meister! LOVE it. My family goes to Haraseeket every year! Love their fried clams and their greasy onion rings!